There is no royalty buried in the Tombs of the Kings, a grand mausoleum found one mile (2km) northwest of Paphos Harbour towards Coral Bay. Rather, it's the final resting place of about 100 Ptolemaic aristocrats who lived and died in the city between 3 BC and 3 AD. The tombs are carved into the solid rock of the cliff above the sea and are beautifully situated, with some featuring Doric pillars and frescoed walls. Archaeological excavations are ongoing at the site, which also features a church known as Paleoekklisia, sporting traces of Byzantine frescoes. 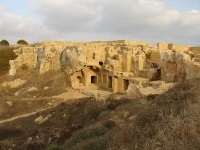 The Tombs of the Kings usually feature very high in tourist reviews of Paphos and are thrilling to discover.